During a brief break in the weather, we ventured out to harvest what remained of our winter crop. 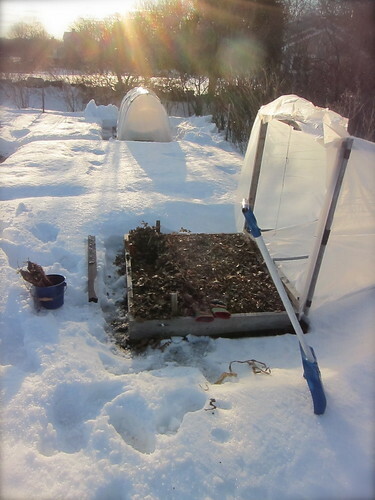 The snow has settled and crusted over, sealing down the covers, and required some earnest shoveling in order to open them up. 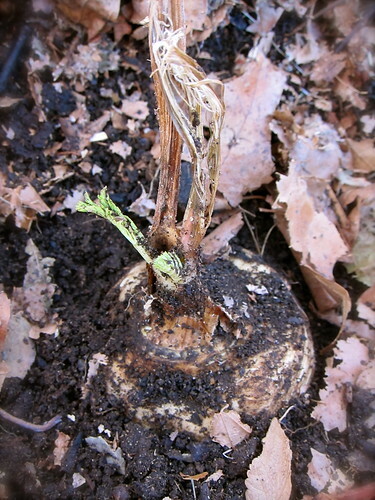 Once the mulch was pushed aside, we found that the parsnips had begun to sprout. We mean to dig up the carrots and parsnips before the end of February. The lengthening days trigger new growth, robbing the roots of their frost-acquired sweetness, and turning them woody and bitter. With spring still a month away, it may be a misnomer to call these “spring-dug.” We wonder if the seemingly premature sprouting is due to their having been covered, rather than left mulched but exposed to the elements. We also harvested the last of the carrots and the remaining leeks, which looked a little worse for wear. They’d been left in the ground too long, but were salvageable. 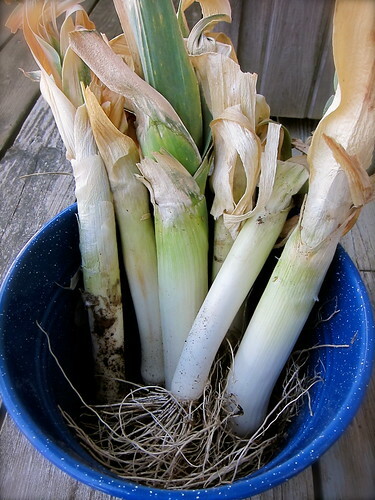 However, the batch of leeks dug up at the end of December fared better by being stored in the refrigerator. Underneath their coat of dirt, the parsnips gleam. This hard-to-get variety called Andover are a good reason to order seed early. 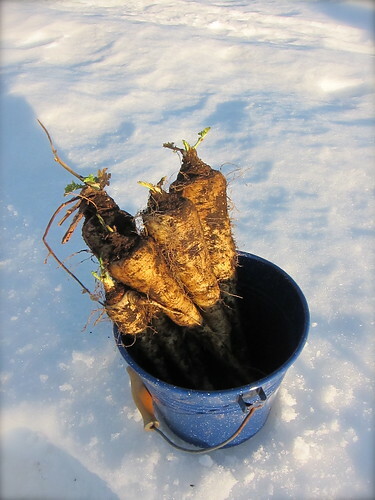 True to their description, the roots average 12″ to 14″ in length. Can you see how they dwarf the colander they’re sitting in? Rumour has it only one of these is enough to serve a family of four. This entry was posted in garden and tagged carrots, leeks, parsnips, season extension. Bookmark the permalink. You go girl!!! Amazing under all that snow! Again, I’ve taken my hat off to you and am waving it for your many winter successes. That is definitely a winter harvest of parsnips and leeks and they look fabulous too! Good work on keeping your winter beds going so well despite the obvious winterlike conditions. that is an awesome February harvest. And in Maine! Congrats. Those parsnips dwarf the colander so much that I didn’t even see it and had to look for it after reading the legend. Wow they are big. I ordered some parsnip seed today although I suspect I will get irritated by how long they take to develop. I have just sown my parsnip seed – Guernsey and Harris market are what i’m trying. Wish I knew about Andover – those are the biggest parsnips I have ever seen! 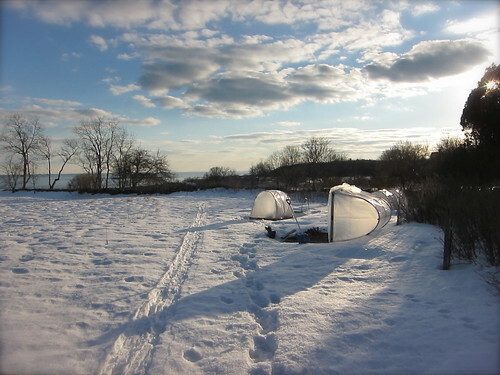 Your cold frame is inspiring! By this time next year, I hope to have one too! Everything looks very nice. 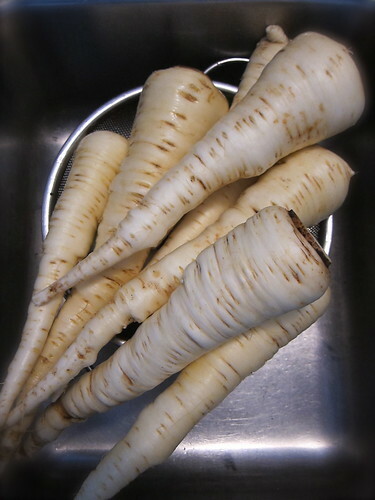 I wish I could get my parsnips to grow even half that big. You certainly got a nice layer of snow there. But it looks so pretty in the sunlight. Look at the beautiful bounty! I do covet the parsnips the most. (Ok, leeks too.) Love it! I bet the leeks are super sweet having been covered in snow. Great harvest! Wowie Zowie! You are a gardening hero! I cannot grow leeks, no matter what I try.